The National Bank of Belarus is closing all over-the-counter currency exchanges in the country in an effort to keep its own currency strong and avoid a domino effect from the ruble crisis. The purchase and sale of foreign currency at bureau d’change will be put on hold until 2017, except for transactions with the National Bank, the regulator said in a statement Monday. At the same time the purchase of foreign currency through the Belarusian Currency and Stock Exchange from the National Bank will be unlimited. Last week Belarus, Russia’s close ally in the Eurasian Economic Union, faced its own ‘Black Friday’. 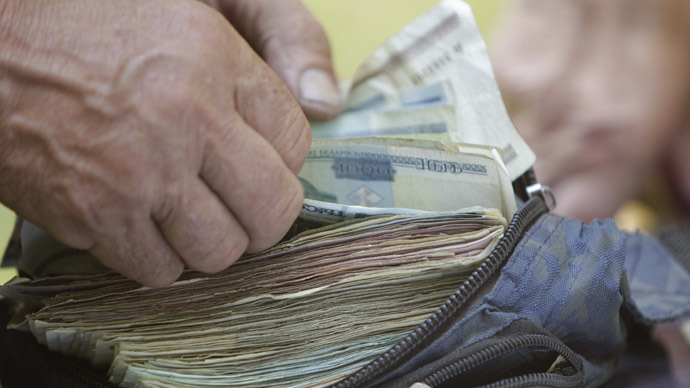 The national currency lost 30 percent of its value shortly after the country’s national bank introduced a 30 percent tax for individuals and businesses purchasing foreign currency.The Belarusian ruble reached 14,150 against the US dollar, and 17,400 against the euro, with the net cost of $1 amounting to 11,000 Belarusian rubles, and €1 to 14,000. “Based on the economic situation in the neighboring countries, first of all, in the Russian Federation, the Government and the National Bank of the Republic of Belarus have adopted a number of measures aimed at preventing the development of negative trends in the foreign exchange and financial markets of Belarus and promote the advantages of savings in Belarusian rubles," the National Bank explained in a statement. The Belarus central bank also increased rates for the mandatory sale of foreign currency earnings from 30 to 50 percent. According to the regulator, as a result, the daily net demand for foreign currency on the stock exchange fell from $180 million to $3 million, and the daily outflow of deposits in Belarusian rubles decreased from $175 million (2 trillion Belarusian rubles) to $79 million (0.9 trillion Belarusian rubles). In another attempt to try and protect itself from the ruble crisis last week Belarus agreed with Russia on fixing prices for exported goods in dollars, according to Belarus Deputy Prime Minister Mikhail Rusiy. The two governments also agreed on what is called a ‘food balance’ for 2015, which they are to approve in January at a joint board of the Agricultural Ministries of Russia and Belarus. On Sunday Belarus President Aleksandr Lukashenko visited Ukraine to discuss political and economic cooperation with his counterpart Petro Poroshenko. In the course of the talks Lukashenko said Belarus is ready to provide assistance to Ukraine anytime and noted an increase in trade despite the complicated situation in the Donbass region.